The essence of Twitter is the ability to send and receive tweets via SMS or text on mobile phone. While receiving tweet updates notification from Twitter is free, sending a tweet to post update on Twitter will normally incur a cost or charged by carrier or use the allocation in free texts (SMSes) bundled in the mobile plan. HeyWire, a popular free SMS texting service developed by MediaFriends, is introducing HeyTweets in partnership with Twitter, a worldwide service which allows Twitter and HeyWire users to send and free free tweets via mobile SMS. 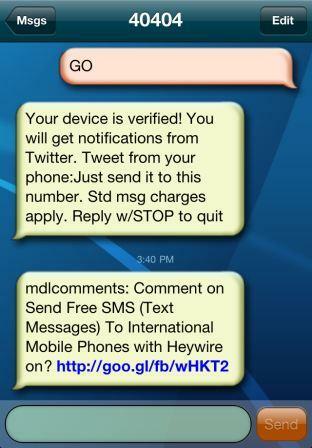 The trick with HeyTweets, which is part of the free HeyWire app, is the support to send and receive text messages or SMSes using the shortcode 40404. Most services that allow users to send free SMS, such as Google Voice, does not support sending and receiving of SMS via short code, a special phone number which normally used for value-added services that requires payment. In fact, HeyWire users does not require any special sign up, manual configuration, or add-on to access Twitter with SMS from HeyWire. In order to tweet from HeyWire via text, just configure the personal private real dedicated phone number in the Twitter’s Mobile Settings, and then follow the instruction to send a verification text to Twitter short number at 40404. Subsequently, any tweets or updates to be posted can be sent from HeyWire to 40404 for free. 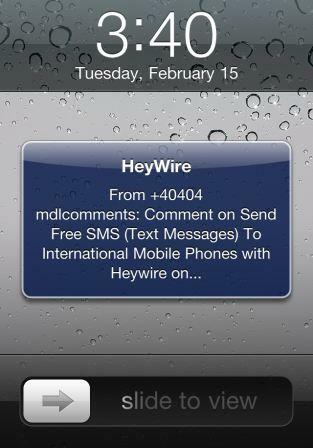 HeyTweets works internationally, which similar to free HeyWire SMS text messaging to local and international mobile phones which available globally regardless of location. The SMS text messages are delivered via Internet through Wi-Fi or 3G data connection. By using HeyTweets as workaround, users who are located in countries where the mobile carriers do not support Twitter Mobile SMS can now enjoy tweeting and notification via texting. HeyTweets supports tweeting in any languages, and the HeyWire app (which is required for free SMS and HeyTweets) is available for iOS (iPhone, iPod touch and iPad) and Android platform. Download HeyWire for iOS from iTunes App Store. Download HeyWire for Android from Android Market.